The football and handball seasons having ended, it was the turn of patinatge artistic – figure skating on roller skates – to take centre stage at the pavilion in Perelló last weekend. On Saturday 3 June, children from throughout the Terres de l’Ebre came to see if they could obtain their certificates. If they get all four certificates available they are then eligible to enter regional tournaments. Everything is exactly the same as in ice skating with judges giving marks out of ten on the performance, both for artistry and mastery of technique. Coaches were there to give support and encouragement to their students whilst those waiting to perform were busy practising in the foyer. The day started with the youngest (benjami) children and then worked through the various age groups up to juvenil. It was a long day but worth it for those who gained their certificates. 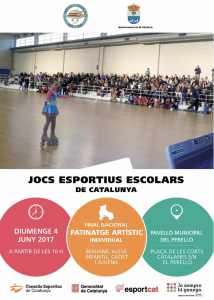 On Sunday, Perelló hosted the Catalan student games when youngsters, mainly, but not exclusively, girls, came to show off their roller skating skills at the pavilion in an attempt to win the individual free-skating trophies. Once again, it was a busy day starting at 10am and not concluding until 6.30pm as all age groups , benjami, alevi, infantil, cadets and juvenil, were all involved. The Terres de l’Ebre were well represented but, as should be expected as they have by far the largest population, the comarcas (districts) of Barcelona had the strongest teams and gained most of the podium positions. As usual with events in El Perelló, the roller skating was extremely well organised with a relaxed atmosphere and enjoyed by all who attended.